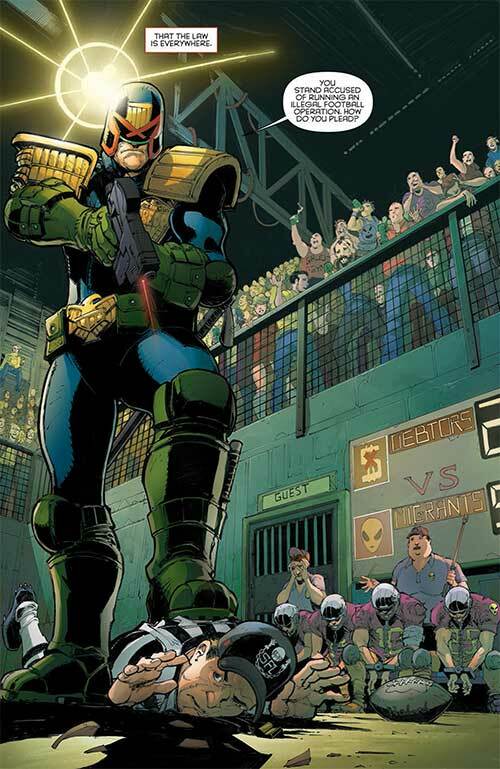 The first issue of this new Judge Dredd series from IDW Publishing opens with a scene wherein Dredd wanders into an underground football arena, bringing law to the lawless as brazenly as can be. He doesn’t try to hide or blend in or sneak around – he shows up, Lawgiver in hand, and does his job. With that taken care of, he’s summoned to the Hall Of Justice where he learns, confidentially, that Judge Beeny went missing a few hours ago at the Patrick Swayze Block. Since her arrival at the block, everything has gone dark. They want Dredd to fined Beeny and get the Block back online. Before he heads out to take care of business he’s briefed on Gilberto Pena, ‘the mayor’ and his gang who basically run the block. As the Judges are spread very thin right now, Dredd will handling this solo – no reinforcements. Dredd gets some intel on the block along the way – it was built to be affordable housing then abandoned due to budget cuts. Unemployment is at 92% - it’s a tough spot full of tough people from tough backgrounds. Shortly after arriving and noting that the com-tower is down, he hears gunshots from the upper floors. The elevators are down but Dredd being Dredd would rather take the stairs anyway. He ascertains that the shots came from the 31st floor – once he gets up there he witnesses an explosion and is then attacked by a three-armed knife-wielding mutant! After making short work of them he finds Beeny, she’s still alive, and she fills him in: she was here to do a classroom visit but upon arrival was attacked by a gang of mutants. She put the block on lockdown and waited it out. Since Dredd’s here now, maybe they can try to sort all of this out. Beeny offers up a faux-surrender which allows them the element of surprise. With the 31st floor cleaned, a hostage taken by the mutants tells the Judges that the mutants control all of the upper floors, they got in through a waste channel on the 45th floor that hasn’t worked in years. But the mutants upstairs are only the beginning of their problems – their leader Talleyrand has hundreds of mutant troops at his disposal and he’s taken everyone above them hostage. The mutants continue their all-out assault on the Patrick Swayze block, but Dredd’s not going to just stand there and take it. He goes on the offensive, with help from Tiger and The Mayor. Together they corner some of the mutants who are holed up in a meat store in the mall. 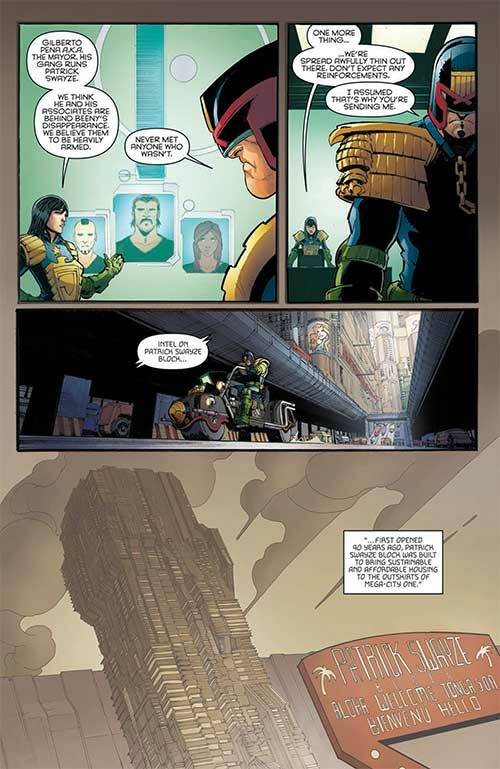 One of the mutants surrenders, telling Dredd he’s not a bad person, he ‘simply acted on the incentives laid before me in a life with few opportunities.’ Dredd accepts the surrender but the mutant’s comrades have other ideas for him. It doesn’t end well. 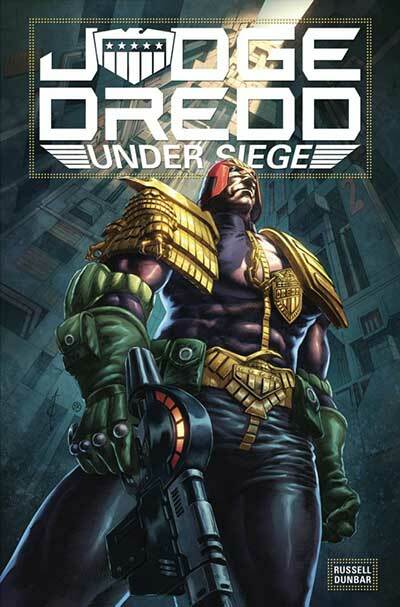 Things calm down but Dredd knows they’ll be back and he encourages the Mayor and his crew to reload and prepare to defend their positions again soon. They don’t move a muscle on Dredd’s command, but once the Mayor okays it, they oblige. Elsewhere, Tallyrand has his minions prepare to set off a dirty bomb at the Five Points section of Mega-City One where it would spread debris for miles across dozens of sectors. But he just lost over a hundred of his mutant soldiers to Dredd and his crew – so getting down from the higher floors they’re on won’t be easy. So Tallyrand gets on the PA system and address the residents (not citizens, he makes this clear) of Mega-City One in an attempt to get the residents of the block to turn against the Judges – and it just might work. Mark Russell’s story is an interesting one. Ripe with a social conscience, at times it feels like it’s setting up something like The Raid with Elements of Death Wish 3 thrown into the mix – using the block (essentially a massive apartment complex) as a singular location to essentially trap the good guys in and forcing them to cooperate with some people that they might not necessarily think to cooperate with. It’s a clever device and one that allows Dredd to see things from an opposite point of view, not something he’s typically good at or even necessarily open to. But here it works, it’s done well without coming across as heavy handed. We understand how and why the people abandoned by the government, by the law, might have to resort to criminality to survive. They are victims of their environment, there’s no chance for them to get normal jobs and lead normal lives simply because they’ve been left to their own devices. At one point a resident tells Dredd “I never seen you before. You ain’t the law, you’re a tourist.” – probably the most poignant line in the entire first issue and one that is clearly going to play a big part in the tension to come. The writing does a really good job of pulling a lot of current day political turmoil into a Dredd story. There’s obviously, and understandably, a lot of anti-cop sentiment going on right now while protests to shut down ICE offices seem to be more common than not in cities with large immigrant populations. It’s important to take this into account when reading the book, it’s obviously where some of the ideas for the story came from and it’s exactly the type of thing that Tallyrand is trying to tap into with his speech to the ‘residents’ and with his actions against the Judges. It isn’t subtle, but it does work and it makes for a story both entertaining and thought provoking. There’s always been a heavy, satirical bent to the best Dredd stories, and Russell is continuing that tradition to good effect. Artwork from Max Dunbar is nice and detailed. 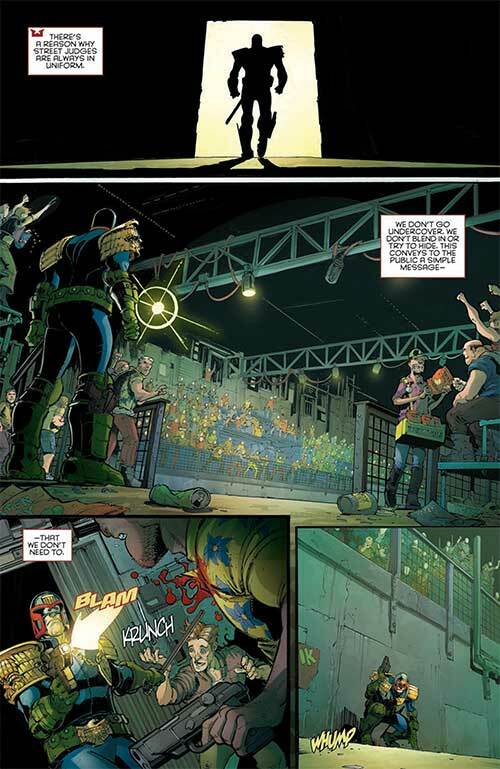 This is a more traditional style than what we’ve seen employed in the last few IDW Dredd runs but it’s good. Dunbar uses nice fine-line work to create interesting looking characters and appropriately thorough looking backgrounds for them to play off of. Action and movement are portrayed well and some clever camera angles, such as the shot where we see Dredd heading up the stairs from the POV of someone above and to the right of him, help to build suspense. There are a few bits where the action literally breaks out of the panel borders allowing him to use an entire page to nice dramatic effect, showing off the scale and the scope of the problem that Dredd and Beeny are going to be dealing with. 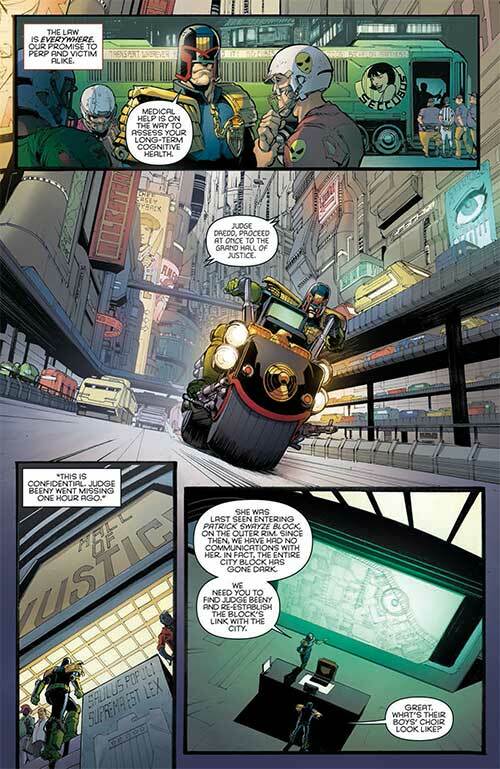 Jose Luis Rio’s coloring work is solid, leaning towards a lot of appropriately grey and industrial colors for most of the book but using some high contrast, bright colors – like the explosion or the neon green of toxic ooze – to provide some nice contrast. All in all, a fine four issue series that starts strong, keeps the momentum going throughout, and ends on a solid note. This trade paperback edition from IDW collects all four issues as well as the different variant covers that were created for the run.